Wonolo – which stands for Work. Now. Locally….has raised a Series B funding round of $13 million dollars which brings it total funding to $25 million. The company’s technology connects employers with vetted workers “within moments”. The new funding comes from Venture capital firm Sequoia Capital. AJ Brustein is one of the co founders and he joins me on the phone from San Francisco. 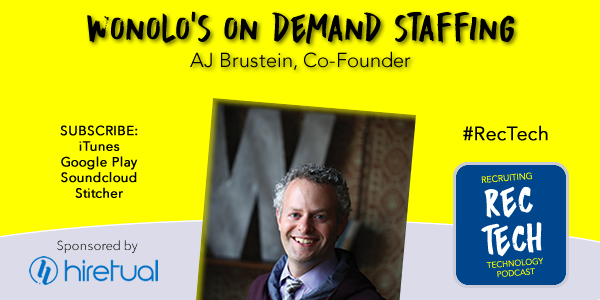 We chat about the company's origin and the on demand labor market they are building in major cities across the U.S. - Visit them at Wonolo.com - Follow AJ on Twitter. RecTech is proudly sponsored by Hiretual. ...and also by our friends at RoboRecruiter.